When Loren and Karen Johnson got married nine years ago — a second marriage for both — they chose to rent in Henderson. Earlier this year they decided to take the leap and purchase. Raised in Las Vegas, the couple initially focused their house hunting in familiar neighborhoods, never giving downtown a glance. “For what we wanted, every single-family home we considered was going to be a project with landscaping, upkeep and amenities. We didn’t want to settle, and our project days are over,” Karen said. When the Johnsons’ real estate agent saw their new home must-have list, he suggested a look at The Ogden. 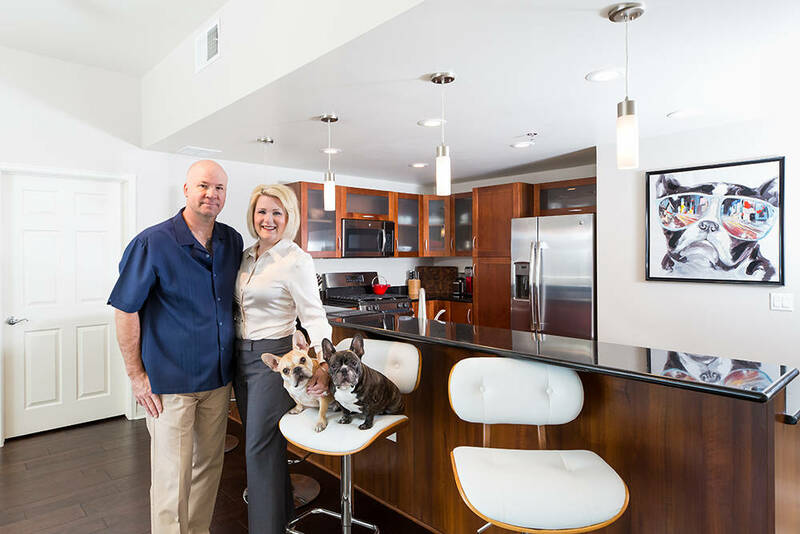 In July, the Johnsons, their son and their four-legged family members, bulldogs Berkeley and Tootsie, moved into their new home, a two-bedroom, 2 1/2 at The Ogden. Professionals who work long hours, Karen is the director of compliance and safety for the Clark County School District Transportation Department. And Loren, who retired as a lieutenant with the Clark County School District Police Department, now works for a federal security company. “We especially appreciate the low maintenance of high-rise condominium living. “Practically everything is done for you, from valet dry cleaning and food delivery to 24-hour maintenance and security. It’s like a never-ending staycation,” Karen said. After moving in Karen and Loren took a week off from work to discover their new neighborhood. “We spent every day visiting everything from the Arts District to Fremont Street, and more,” Loren said. The Johnsons also are relishing in the accessibility and eclectic nature of neighborhood restaurants and nightlife. “We love food and discovering new eateries. Here we can walk to restaurants and entertainment. If we don’t feel like going out, we can cook in our gourmet kitchen or barbecue on the Sky Deck,” Karen said. Some of their favorite haunts so far are Common Wealth and Don’t Tell Mama piano bar, as well as Oddfellows and Rachel’s Kitchen on The Ogden’s ground floor. Two members of the Johnson family who are getting their daily pampered exercise are the pups. Berkeley and Tootsie are loving the 24-hour, on-site dog park. Loren and Karen said they love showing their new place off to family and friends. “Mom, a longtime Las Vegan, at first thought our move to downtown was bit quirky. But, like us and everyone else who visits The Ogden and downtown, she got it. Now she loves visiting,” Karen said. Since acquiring The Ogden in 2013, DK Las Vegas has made a $2 million investment to remodel the lobby with high-end design treatments to create an immediate sense of luxury and arrival; added new upgrades throughout all residences, including new lighting, hardwood floors, granite countertops and stainless-steel appliances; and enhanced amenities such as a Sky Deck, social lounge, fitness center and remodeled rooftop pool. Right outside the front door of The Ogden are more than 150 restaurants, many of them among the city’s most popular eateries, bars, attractions and an energy that continues to build with the ongoing redevelopment of downtown Las Vegas. The Ogden offers flexible financing options, including Veterans Affairs- and Fannie Mae-backed loans, making it easier for homebuyers to lock in their dream homes. 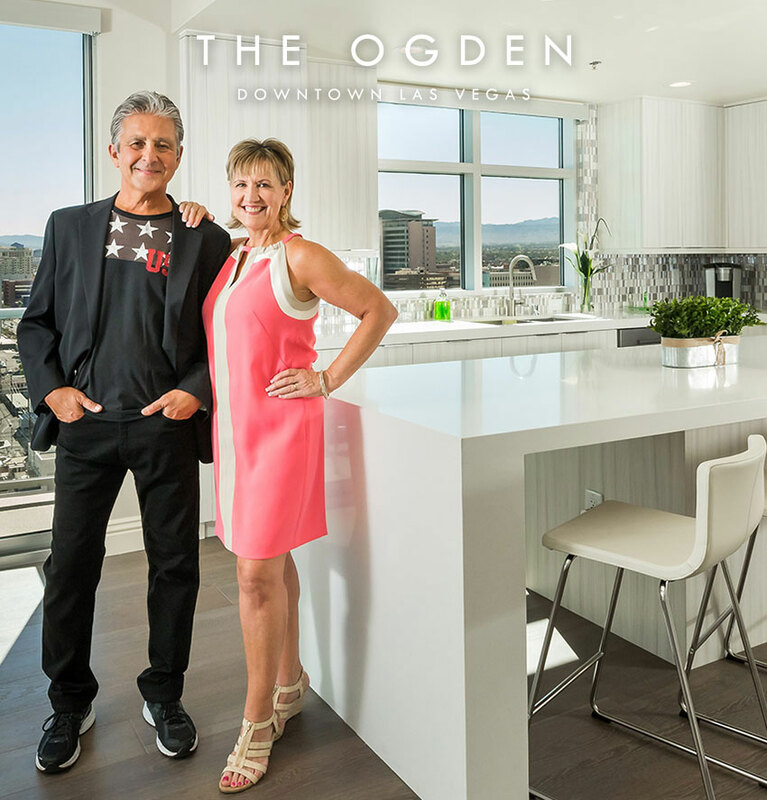 Available homes at The Ogden range from a two-bedroom, 1,180-square-foot residence priced from the mid-$300,000s to a three-bedroom, plus-den, 2,044-square-foot home starting in the low $500,000s. The Ogden’s single-story, open floor plans offer flex spaces that can serve as a home office, den or yoga room, extra bedrooms for accommodating multigenerational family and guests and expansive windows that fill interiors with natural light.